I tend to collect bumps, bruises, and minor burns. In fact, it’s a very strange week if I haven’t received some minor accidental injury! A barbell is probably the number one way I receive some sort of minor injury – I bruise the skin on my collarbone at least once a week. 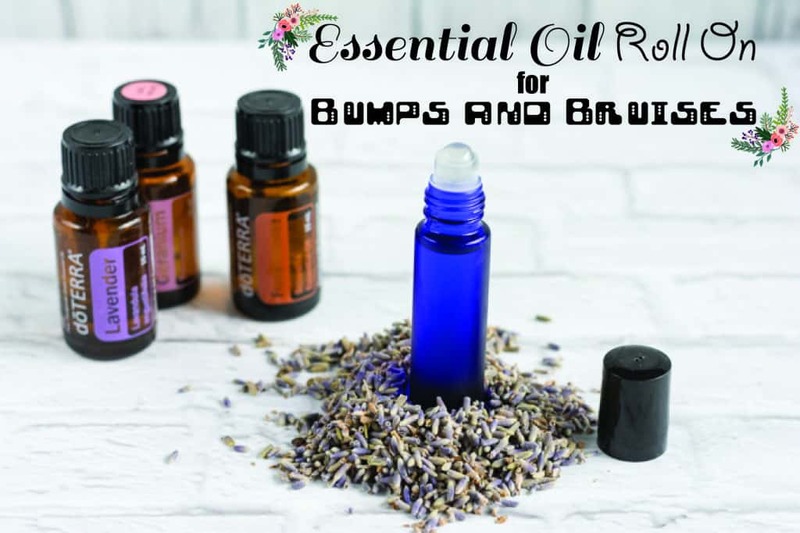 Even if you’re not into lifting, bumps and bruises are very easy to pick up, which is why today I’m sharing my favorite essential oil roll on blend for bumps and bruises. 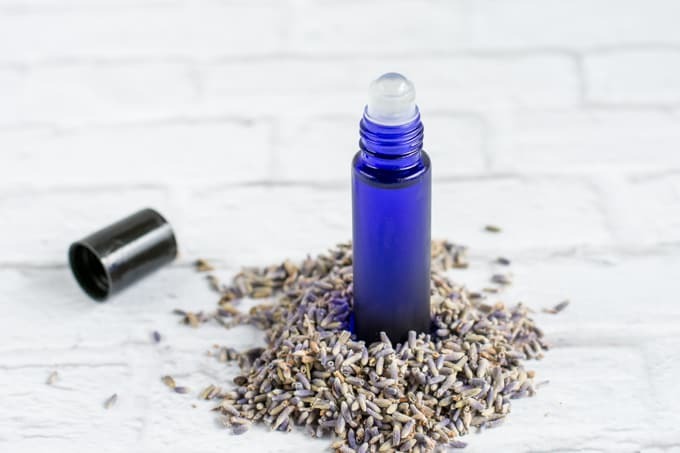 This roll on recipe uses three essential oils: lavender, frankincense, and geranium. Lavender is soothing to the skin, frankincense is known for its healing properties, and geranium is also great for skin health. If you’re not familiar with geranium, it smells similar to rose petals. How nice! Lavender and frankincense happens to be my all time favorite diffuser combination – I use it in my petal diffuser every single night. Lavender is one of those essential oils most people even marginally interested in EOs have, but geranium is a little less common and frank has a reputation for being expensive. If you don’t have any one of these three oils, don’t let that stop you from making the roll on! Even lavender by itself is beneficial. Also, you can decrease (or even increase!) the quantities of each oil if you want/need something different. Every person responds to essential oils a bit differently, so do what works best for your body. 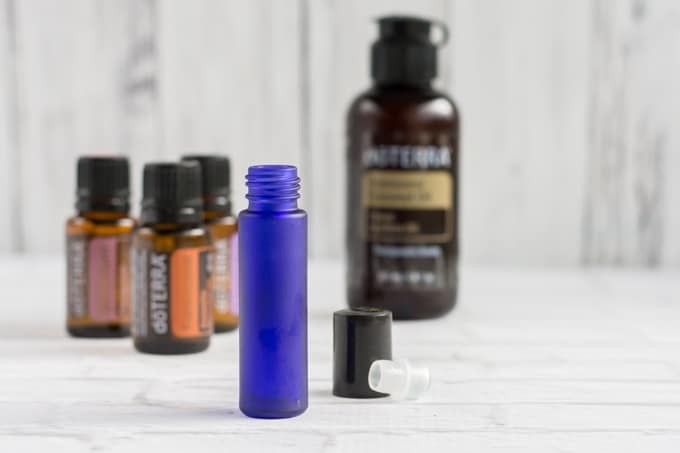 Make this roll on recipe with whatever essential oils you feel most comfortable using – just make sure they’re actually pure essential oils! Many grocery store-type essential oils and oils that make you say “wow, I can’t believe what a bargain this is!” have fillers, which aren’t necessarily things I want on my skin. 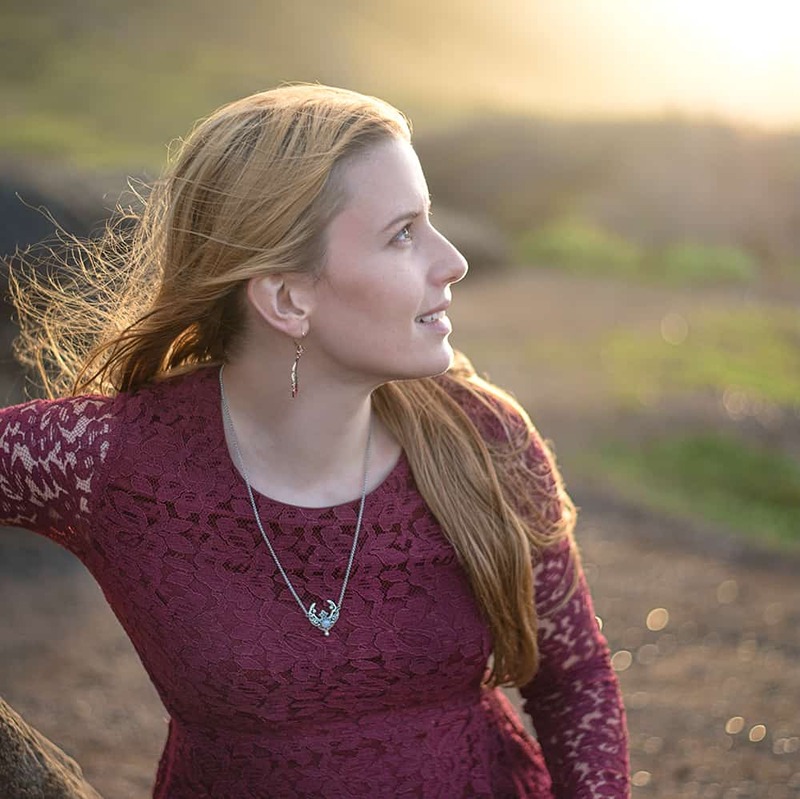 Like I said, I use DoTerra (and you can read more about this on my page “Why Essential Oils”), but I have friends who use different brands and that’s totally okay with me – I’m not going to argue with them! I won’t argue with you, either. 2018 Edit – there are so many more essential oils on the market today than there were just a few years ago! 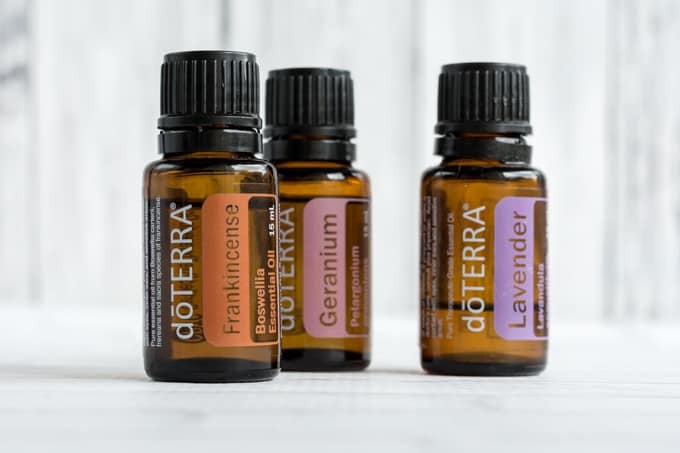 I am no longer a DoTerra WA for several reasons, one of them being that I can find pure essential oils elsewhere these days. For example, while not all of Now Foods oils are pure and undiluted, they are very clear about marking which are and which aren’t to make shopping for eo’s easy. 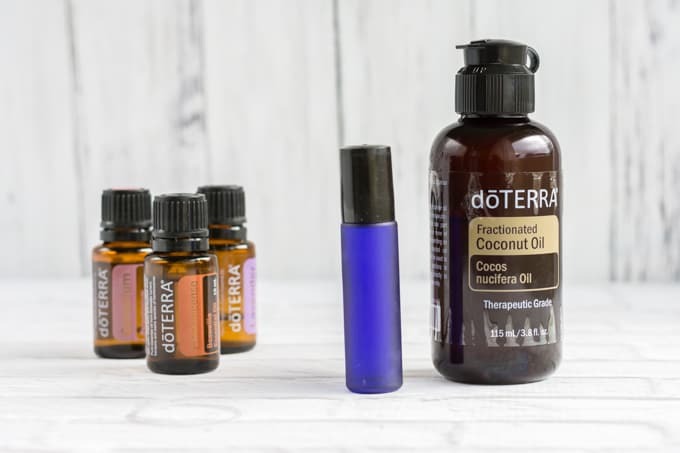 If you do want to try DoTerra, you absolutely do not have to be a member of anything and you can browse all their products online. In addition to the essential oils, you will also need an empty/clean roller bottle and either fractured coconut oil or sweet almond oil. I bought a package of blue glass roller bottles on Amazon and I love them! They work well and colored glass is supposed to help keep the essential oils from degrading. Add carrier oil until the bottle is full, pop the top back on, and use! As I mentioned above, feel free to decrease any of the oil quantities. I used to make this recipe with twice as much essential oil, but then decided that a greater dilution would be safer considering how much of this I use. Some people report skin sensitivity to lavender when applied neat (undiluted), but this roll on is diluted. If you’re one of those lavender-sensitive people, though, you know best how much you need to dilute it for personal use! I’m really glad I mixed these oils together in a roller bottle. I dabbed each one on my skin individually for months before I had the idea to create a roll on! How silly of me. Do you have any go-to products for your bumps and bruises? Do you also collect minor injuries? Hey, was looking for something to use on my almost 3 year old. I only have the Lavender & frankincense. But was wondering if this dilution amount was appropriate for my LO in a 10 ml roller bottle? I made this mixture up and it is amazing. It smells so good you could use it for a parfum. I’m putting a drop of each on my necklace defuser. Thanks so much for this great remedy.